Can I be sure of data security using API2Cart? API2Cart service takes serious measures to protect our clients personal and store information. Is it safe to download connection bridge? API2Cart service requires bridge downloading to establish integration with your software and retrieve data from stores. A connection bridge is the most secure method to access store data. The data you retrieve will be used only in order to perform certain API2Cart methods. Why API2Cart may need access to the online store or server? In order to investigate issues and to troubleshoot reported problems, or download the connection bridge file API2Cart support technicians may require access to online store, web server and database. Depending on the task which needs to be performed, an API2Cart technician may require access to your online store. We strongly advise you to change the password of Admin/FTP accounts being provided with a random password for API2Cart support for the duration of the issue, with only the essential permissions to your online store. In order to investigate the problems, API2Cart support may require access to the files of your online store installation. Follow the steps outlined in the Access to your online store section of this article. If your systems are protected by IP address authentication (e.g. if you have a firewall), please let us know and we will provide you with the list of our office IP addresses to allow through. API2Cart doesn’t store any data, but only transmit it via API requests. 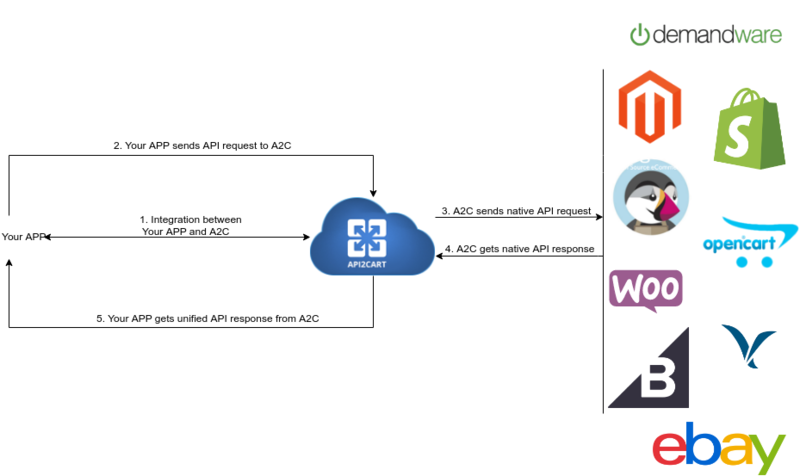 The scheme below shows data flow between our customers’ software, API2Cart and shopping platforms. Bridge file. API2Cart service requires bridge downloading to establish integration with your software and retrieve data from stores. A connection bridge is the most secure method to access store data. The data you retrieve will be only used to employ certain API2Cart methods. You can find the list of the accesses needed here. Here, you can find a video tutorial on how to download bridge for bridge platforms easily. A similar tutorial for all the rest platforms can be found here. The bridge can be downloaded automatically with the help of the bridge.download method. Find more details on this issue here. IMPORTANT: When API2Cart sends a request to the bridge file, the “token” parameter is required. This parameter should have the store key value as it is shown in the example picture. That is the way we check if the bridge is functioning correctly. All the other bridge-involving actions are performed the same way with just the “action” parameter changed and adding another parameter added. The Store Key should be indicated EVERYTIME a bridge-involving action is performed. Otherwise, this action will not be performed. That is the way we do the authorization. If the store Key is indicated incorrectly, you will get the error you could see above. FTP accesses are used to upload a bridge in order to specify connection with self-hosted carts. In order to investigate issues and troubleshoot reported problems or download the connection bridge file, API2Cart support technicians may require access to the online store, web server and database. It is recommended to temporarily change the password of the admin account before providing a technician with access to your online store. Once your issue is resolved, you should change the passwords of all the provided accounts as soon as possible. The technician will make it clear to you what access exactly we need to solve your problem. More details on which accesses API2Cart techs may ask can be found here. How can I disable notifications from API2Cart? 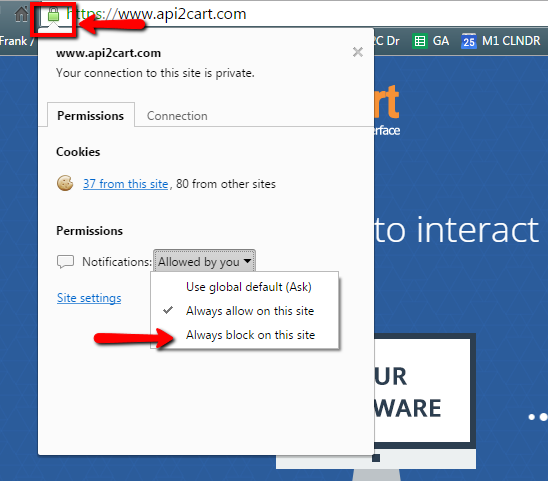 Click the right mouse button on the notification and choose “disable notifications from www.api2cart.com”. Go to API2Cart website and press on the lock symbol in the address field. Choose “Use global default” from the drop down list.